To those who are unfamiliar with it, the Bronx can be thought of as a dangerous place. In reality, it is a wholesome community, in which there are people living their lives to the best of their abilities. The amount of coverage that the Bronx receives is not nearly sufficient to portray the developing borough which thousands call home. In a meeting with Bronx Beat reporters, Jordan Moss, a 46 year-old, longtime journalist and Bronx resident, explains how he has dedicated his life to giving a voice to the stories untold, and making a change in the way people see life in the Bronx. From a young age Moss realized that he had a passion for writing, but admitted to not pursuing these interests immediately. Starting off as a freelance writer, Moss stated that he wrote about issues he thought needed to be further unmasked to the public. Now, having worked for multiple publications such as The Norwood News, City Limits, and some non-profit organizations, he tells of how being a journalist has changed his life. One of the people he spoke to was a father who had lost his son in a building fire caused by a neglectful landlord. He learned, by accompanying the man to his son’s gravesite, that he could not afford a headstone. After writing a story about the fire, Moss decided to raise funds for the headstone, which was placed at the dead boy’s grave. This story’s coverage by Moss shows how he was able to care about both his writing and the subjects of his stories. “People should care more about what’s going on,” Moss says about the lack of news coverage about the Bronx. Moss offered many poignant statements based on his own experience as a writer, and particularly as a writer in the Bronx. 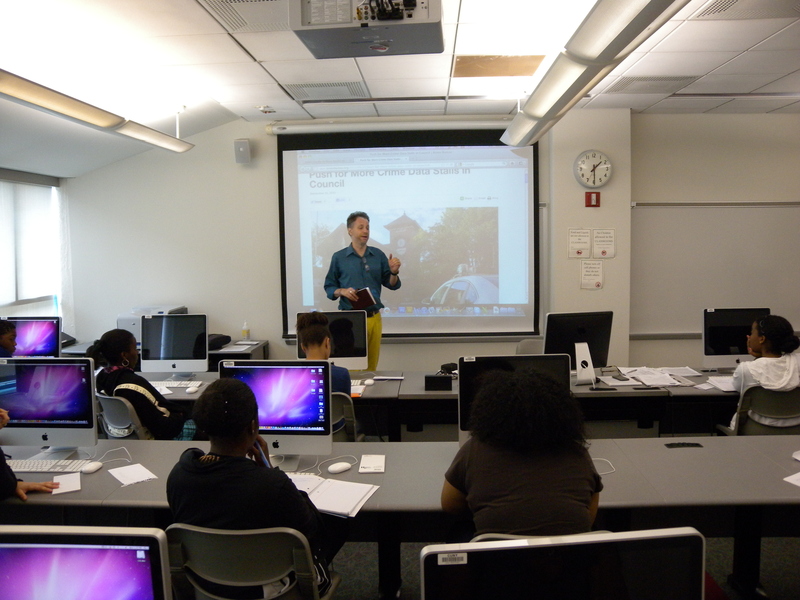 The advice given by Moss and the stories he shared shed some light on the issues to be covered by anyone reporting in the Bronx and pursuing a career in reporting in general. Although Moss understands that being a journalist and reporter comes with unforeseen roadblocks he tries to make others feel as comfortable as possible, and jumps through as many hoops as necessary to make an impact. As inspiration for future stories Moss suggests looking up public information, for instance about electrical outages in buildings, or the overall rising number of families being forced out of their homes due to corrupt landlords, and inhumane living conditions. “Any reaction positive or negative is a good thing,” he said. 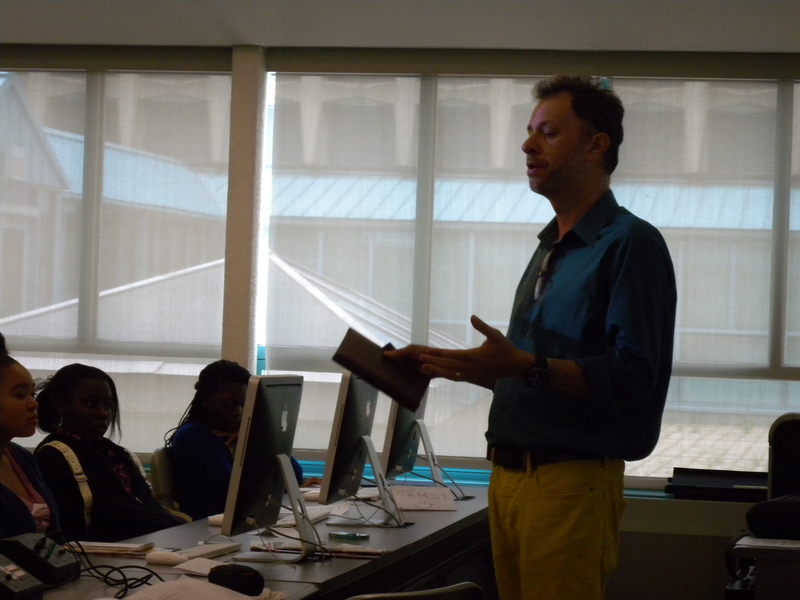 City Limits editor Jordan Moss shared tips and anecdotes about his two decades as a Bronx reporter. “Any information is useful in this line of work,” he said, as a piece of advice to young reporters looking to collect ideas for future stories. The current lack of information about the Bronx is what leads to the persisting stereotypes affiliated with the area, Moss suggested. “If every one of you were to choose an area in the Bronx and publish a single story on it daily that still wouldn’t be enough,” he told the Bronx Beat reporters, referring to the wealth of stories to be written about in the Bronx. People want information on the borough, but the problem is that there are not enough outlets for that information to get out, he said. The Bronx is an essential part of New York City, and when people disregard it with such inattention, Moss is personally bothered because he feels an emotional connection with a neighborhood he has covered through changing times. After twenty years of coverage throughout the Bronx Jordan Moss has not lost his passion and respect for the area, and said he hopes to continue to cover the borough. When asked whether he would be interested in foreign correspondence he reiterated his love for local reporting. “I just don’t see myself doing that,” he said, about leaving the Bronx to report internationally. Moss, who has dedicated his life to writing about the Bronx, is an inspiration to those who think local reporting may not have a future. When he said, “I still have a lot to learn,” his humility gave hope to those who may think that they do not have what it takes to change the minds of potential readers and make an impact.